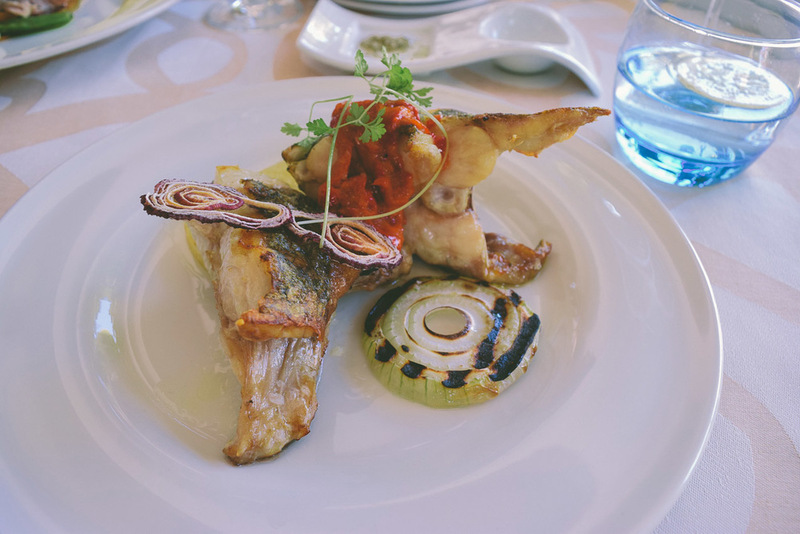 Where We EAT: Bistró del Jardín, Alcúdia. I have never realized it, but the other day was my first time in Alcúdia, and quickly after parking the car I knew why. I was dressed for a casual lunch, in a summer cotton dress with lace accents and my black wedge espadrilles, when I noticed I was surrounded by men with no shirts on, women in skimpy bathing suits and those adorable shops selling little buckets that come with long colorful straws. So distracted, I almost walked right past the entrance of Bistró del Jardín. Let's just say, the Bistró is right in the heart of it! After walking through the floral archway entrance, the outside noise seemed to fade away and I quickly remembered where I was headed. We made a reservation but it seems that for lunch you could easily wander in if you were a party of 2 or 4. The Bistró is part of a larger Restaurant group run by Maca de Castro and her brother Danny, and all of the buildings are connected. 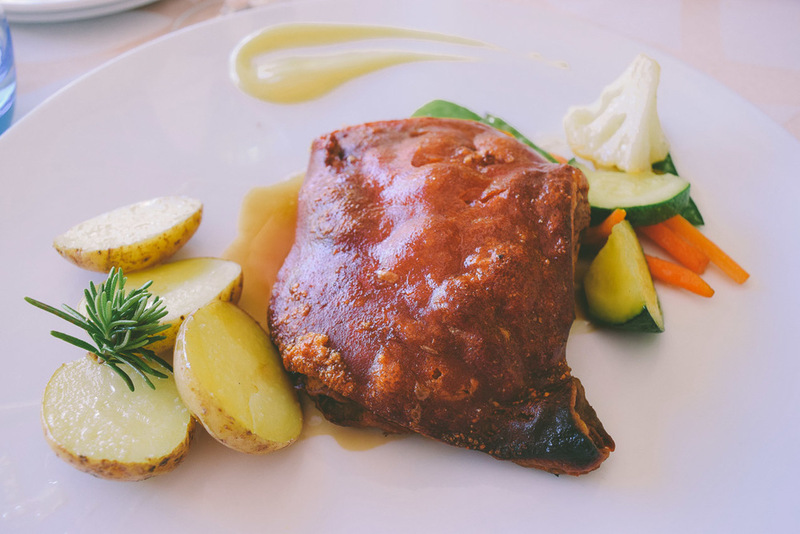 You could easily go to lunch at the Bistró, then move over to Danny's Gastropub for snacks before dinner at Restaurant Jardín! Ok, maybe that is just my idea of heaven! Slowly I start to settle into my seat and I tune into the music playing faintly in the background. Edith Piaf is singing her love songs and it all makes sense. I ordered an Aperol spritz and finally opened the menu. 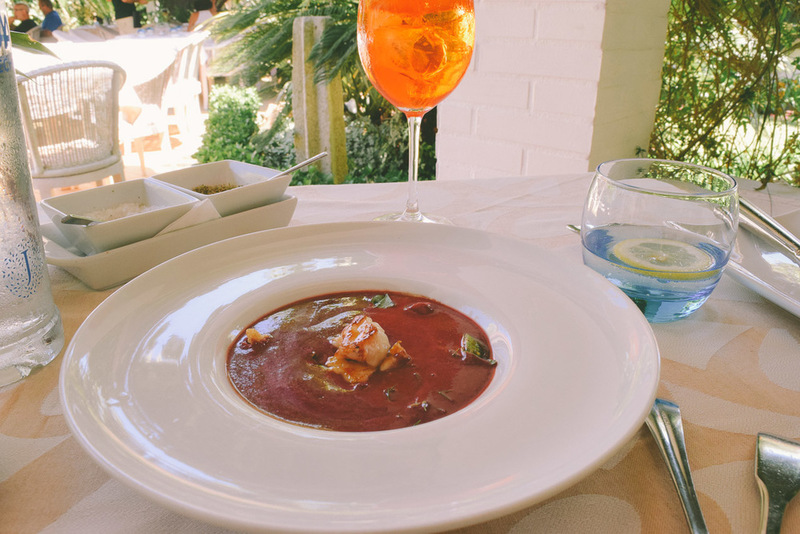 We ordered the Grilled Octopus & the Cherry Gazpacho to start, and although the gazpacho wasn't a beautiful vibrant color the subtle hints of cherry made this soup a perfect alternative to the classic. 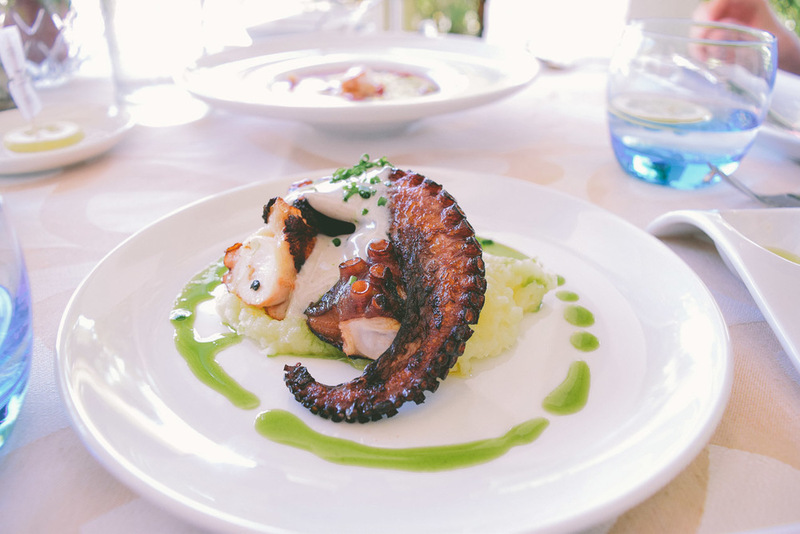 THAT Octopus though, was grilled to perfection and most of the time I don't dare order it at a restaurant in fear of it tasting like a Goodyear tire. This had moisture, a slightly charred taste and with a drizzle of parsley oil could have been easily one of my favorite dishes, EVER! We decided to finally order a bottle of wine and our main entrees, but here is when something magical happened. Our waiter knew we were on the slow path, wanting to enjoy our lazy afternoon of dining and drinking and asked us if we would like a minute to finish our cocktails before moving onto our entree. This man knew exactly what I was thinking! YES! The rest of the meal was exactly how it began, and I left with a giant smile on my face. If this was the quality of the food at the Bistró I cannot wait to see what the Restaurant has to offer. Dare I say, I'm looking forward to my trip back to Alcúdia, ok well maybe just this little Oasis that Maca de Castro has created. Bon Profit! For Reservations they have a convenient reservation form if you don't have a phone. Where We Eat: Quadrat Restaurant, Palma de Mallorca. 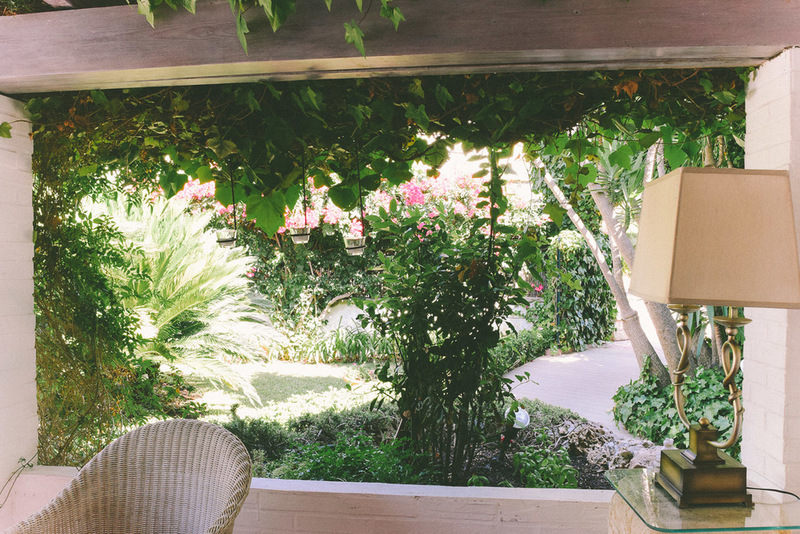 Where We EAT: Boutique Hotel & Restaurant Ca's Xorc, Sóller.